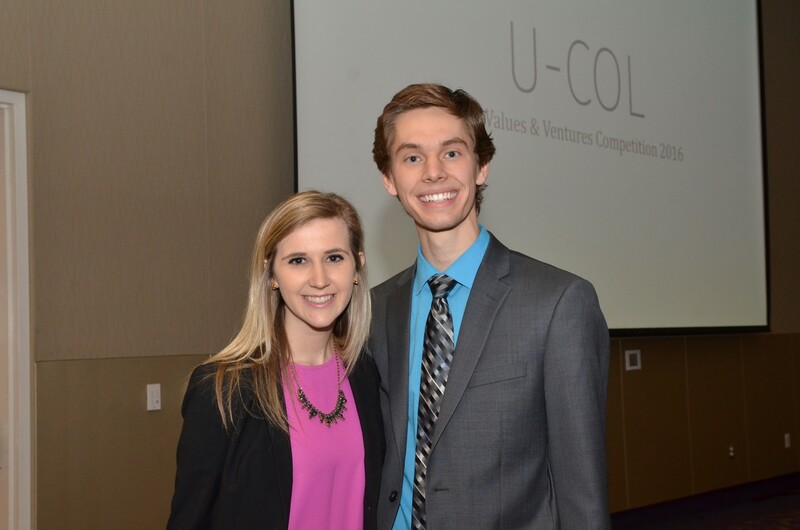 On Saturday, April 9 Zoe Bruyn and Jordan Vanderham of Grand Valley State University received an honorable mention and $2,500 at the Sixth Annual Texas Christian University (TCU) Richards Barrentine Values and Ventures Competition. The invite-only undergraduate business competition is known to be one of the most prestigious in the nation and saw 47 teams present ideas for products or services that would improve the quality of life for a specific population while turning a profit. The competition awards a total of $77, 700 to winning teams. Bruyn and Vanderham presented on behalf of a U-Col, an external female catheter solution for women that suffer from fistula. They were one of nine teams to make into the final round, including The George Washington University and Johns Hopkins University. Bruyn is a junior year business major at GVSU and President of GVSU Collegiate Entrepreneurs Organization (CEO). She has been collaborating with Spectrum Health Innovations for the past three months in order to bring U-Col to market. She worked closely with the GVSU’s Center for Entrepreneurship and Innovation to prepare her pitch for the competition. Loyola Marymount University was awarded First Place and $25,000 for their solution to high-cost bank fees for the low-income population. The George Washington University was awarded Second Place and $15,000 for The Rooftop Tea Company, a business that seeks to help women in disadvantaged communities areas utilize their dwellings to create an income stream. Johns Hopkins University was awarded Third Place and $10,000 for a patent-pending ultrasonic tip that separates scar tissue in the spinal cord during surgery. This is the second consecutive year that a GVSU student team has made it to the final round at TCU’s Value and Ventures Competition. In 2015, former GVSU students Michael Kurley, Vanessa Gore and Lindsay Noonan were awarded Second Place and $15,000 for their heated gloves that provide relief for those who suffer from Raynaud’s.